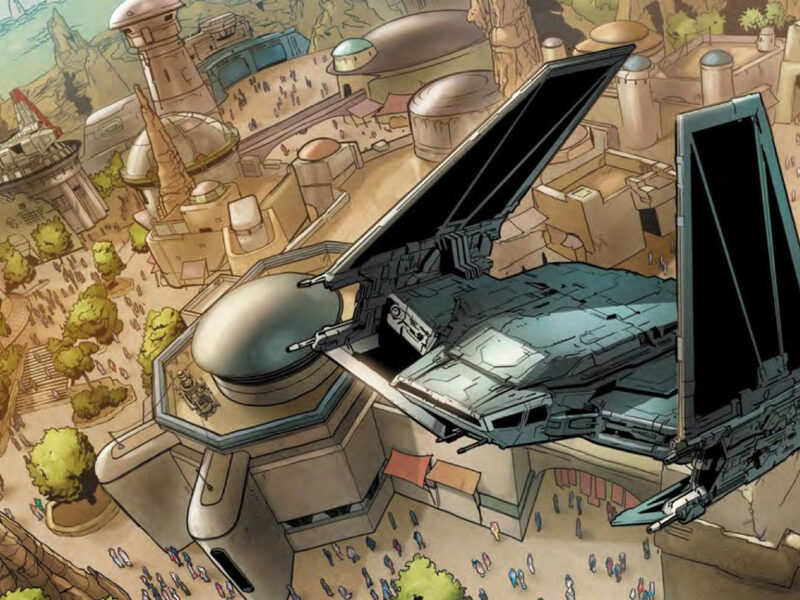 Happy Rancor explores hidden gems in and around the orbit of Star Wars — from old video games to comics to underrated novels — that have maybe been forgotten, but deserve a little more consideration. 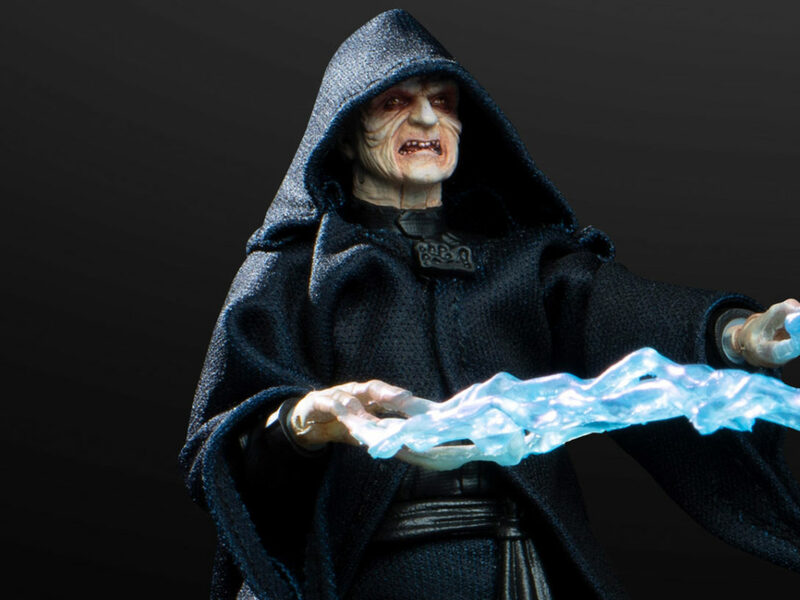 In this installment, we take a look at Star Wars toys that require proofs of purchase, postage, and patience. One element of Star Wars collecting that I’ve always found fascinating is the mail-away action figure, a designation usually reserved for characters especially important to the saga or those that are just visually interesting and mysterious. The process is pretty straightforward: clip and send in “proof of purchase” UPC bar codes from previously purchased items in exchange for a free (more or less, depending on whether or not a shipping payment is required), not-available-anywhere-else toy. It isn’t immediately evident, but mail-aways have quite a big legacy in the history of Star Wars merchandise. This piece is a light history of mail-aways, combined with some autobiography regarding my experience with these special figures. In a sense, the first Star Wars figures were mail-aways. In 1977, after the release and smash success of Star Wars, fans and kids were willing to buy Star Wars anything, especially action figures. 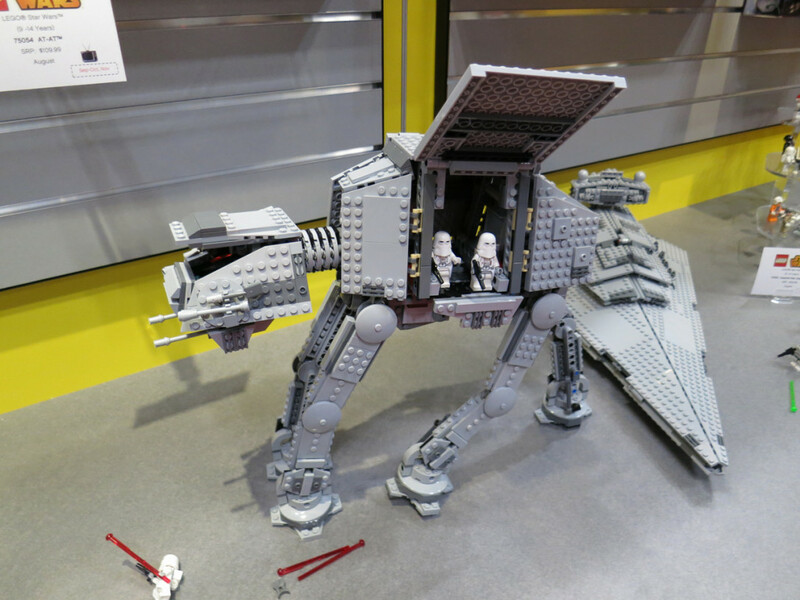 But toymaker Kenner didn’t have them ready. 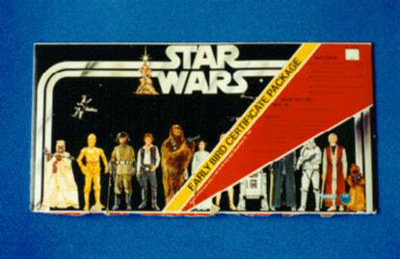 In response — and in order to not miss out on holiday sales — Kenner created what has become known as the “Early Bird Kit.” Basically a pre-order program (pretty unheard of at the time for toys), customers went to an actual store, paid for four figures — Luke Skywalker, Princess Leia, Chewbacca, and R2-D2 — and received the Early Bird Kit. 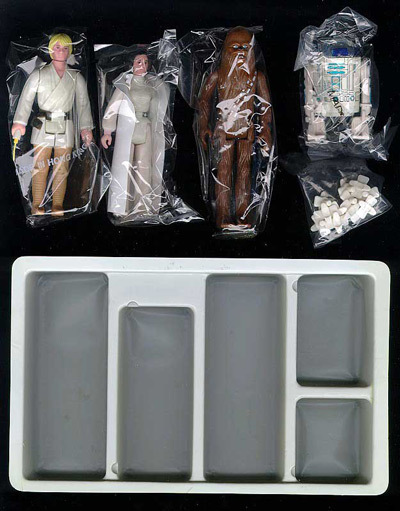 Inside the kit were stickers, a mail-in form for the figures, and the infamous “Empty Box,” which was an I.O.U. cardboard diorama of sorts, featuring pictures of the series’ first line of toys. The Early Bird Certificate Package. Image courtesy theswca.com. The Early Bird Kit toys. Image courtesy theswca.com. That year, children across the country opened empty boxes on Christmas — for better or worse. But the program worked, and that’s how many kids got their first Star Wars figures, even if they had to wait awhile. And today, Early Bird Kits themselves are sought-after collectibles. 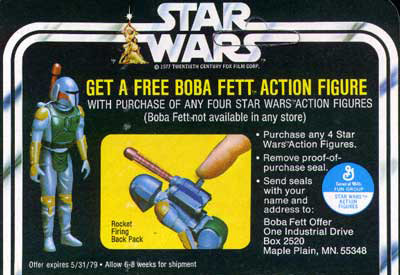 Star Wars would soon get its first bonafide mail-away figure, however, with what is probably the most legendary of all mail-away toys: rocket-firing — or so Kenner said — Boba Fett. 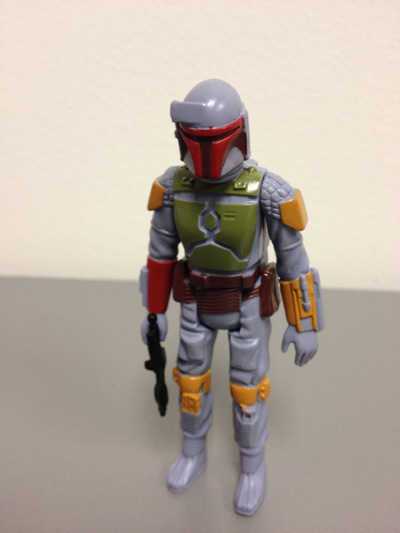 Boba made his first appearance in 1978’s Star Wars Holiday Special, and Kenner decided to release him as a mail-away in advance of 1980’s The Empire Strikes Back. 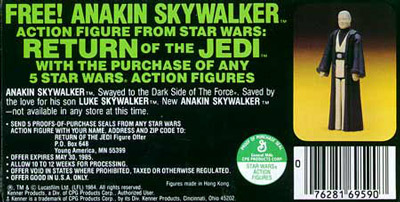 This mail-in offer, advertised on the cardbacks of existing figures, was the genuine article. You clipped four proofs of purchase, sent them in, then went through an important rite of passage: something I like to call “The Waiting.” And then, Boba would arrive. 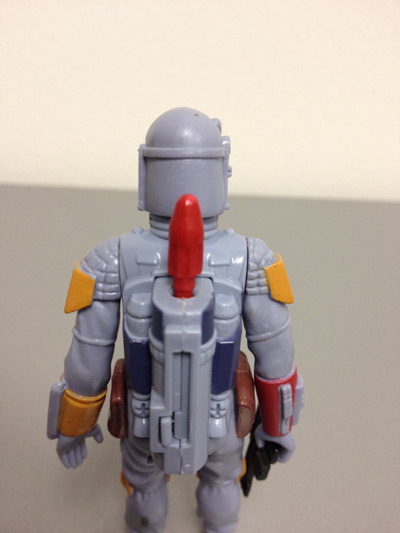 The only problem was, Kenner advertised the toy as having a rocket-firing backpack. 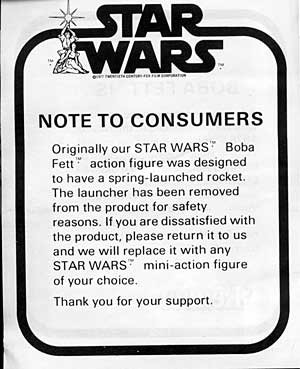 In the figure that shipped to fans, the spring-loaded rocket had been removed for safety reasons. This was like waiting for the Beach Boys to put out Smile in 1967 — an album that promised to eclipse Pet Sounds, to take rock in new directions, to best the Beatles — and then they meekly, almost apologetically, push the watered-down Smiley Smile out the door. It’s not the awesome thing that was promised! Non-firing Boba still went on to become one of the most popular Star Wars figures, but kids were left wondering what could have been. The cardback ad for Boba Fett with rocket-firing backpack. Image courtesy theswca.com. The disappointing note that shipped with the final version. Image courtesy theswca.com. 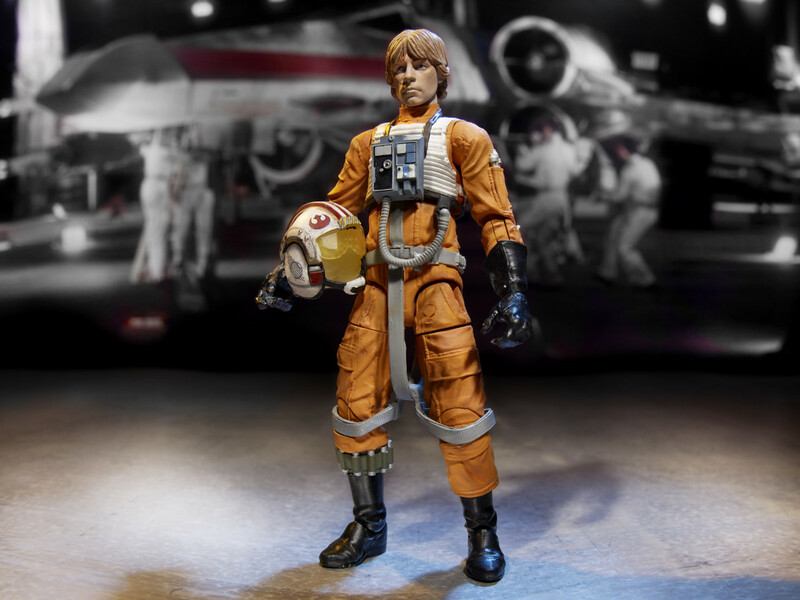 Prototypes of the original version actually made it out into the public, and are among the Holy Grails of Star Wars action figures. (And much like Brian Wilson finishing Smile in 2004, things would be made right with rocket-firing Boba Fett. More on that in a bit.) Kenner would have several more mail-away offers in the next couple of years, including a sneak preview of Bossk, weapons packs, and Admiral Ackbar (advertised as coming from Revenge of the Jedi!). I didn’t get any of these, but took the mail-away plunge shortly thereafter. 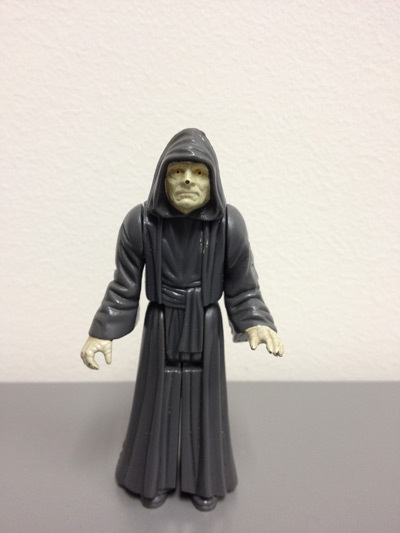 My first mail-away figure was the Emperor — a 1983 five proofs of purchase mail-in exclusive. Truth be told, I only have a vague recollection of getting him. All I really remember is that he came in the mail. My original, mail-away Emperor, nose-circle and all. My second mail-away was 1984’s elder Anakin Skywalker, as he appears at the end of the original cut of Return of the Jedi. 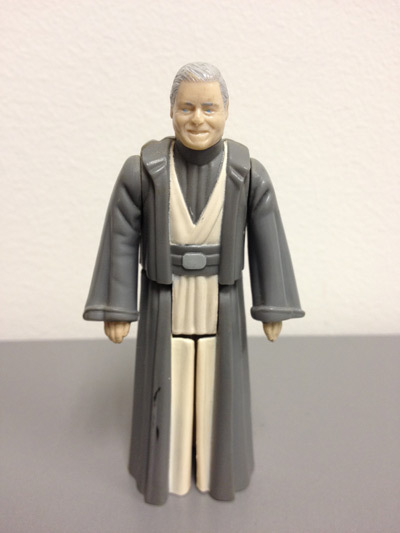 It was the last figure from the Return of the Jedi line, and Kenner’s last mail-away toy for years. 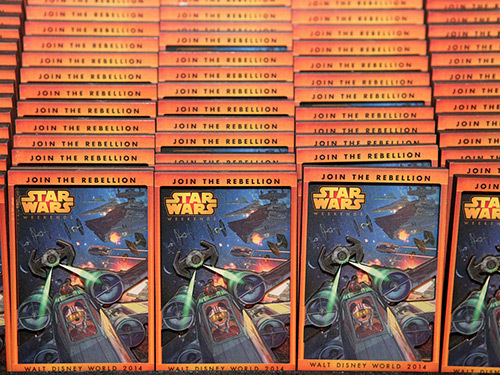 Unlike the Emperor, I remember the process of getting Anakin very clearly: cutting the five proofs of purchase with my mom in the kitchen of our family’s Brooklyn apartment, taking the envelope to the post office, and then, of course, The Waiting, which seemed endless. But then, one day, out of the blue, it came: A small, action figure-sized white box, addressed to me. When you’re four years old, that is an amazing feeling. And what was extra-special was the significance of the figure — I knew what Anakin meant to the saga and what his return to good meant thematically. So having a toy that represents all that, and being able to partake in the process of getting him, had real significance for me. I’m glad I have that memory. The original cardback offer for Anakin. Image courtesy theswca.com. My original mail-away Anakin. Still looks good after all these years! Fast forward to 2010. 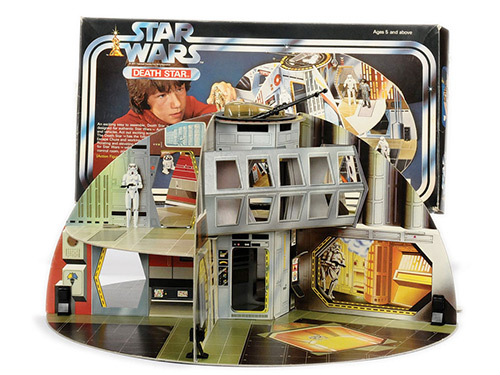 Star Wars toys were still alive and well thanks to continued support from fans and Hasbro, who bought Kenner in 1991. As part of its Vintage Collection line of highly-detailed, highly-articulated figures presented on beautiful retro packaging — which I am hardwired to love — Hasbro decided to make things right, Brian Wilson Smile-style, with rocket-firing Boba Fett. 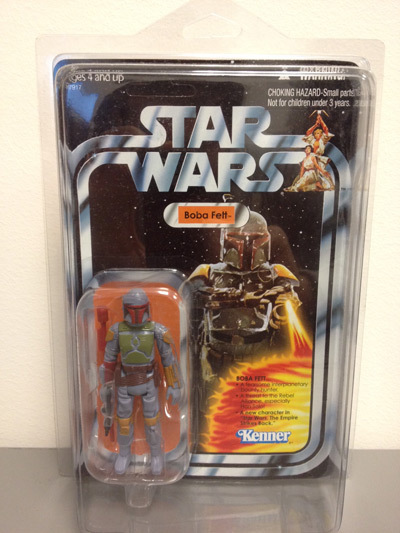 The toymaker created an actual rocket-firing Fett, based on the classic figure’s original mold, enclosed in a card mirroring the packaging style of the original release. There was a new mail-away offer, requiring consumers to fill out a redemption certificate and send it in with five UPCs and $6.99 for shipping. I’d passed on mail-aways in the ’90s and ’00s, but for this one, I couldn’t resist and went through the whole routine. 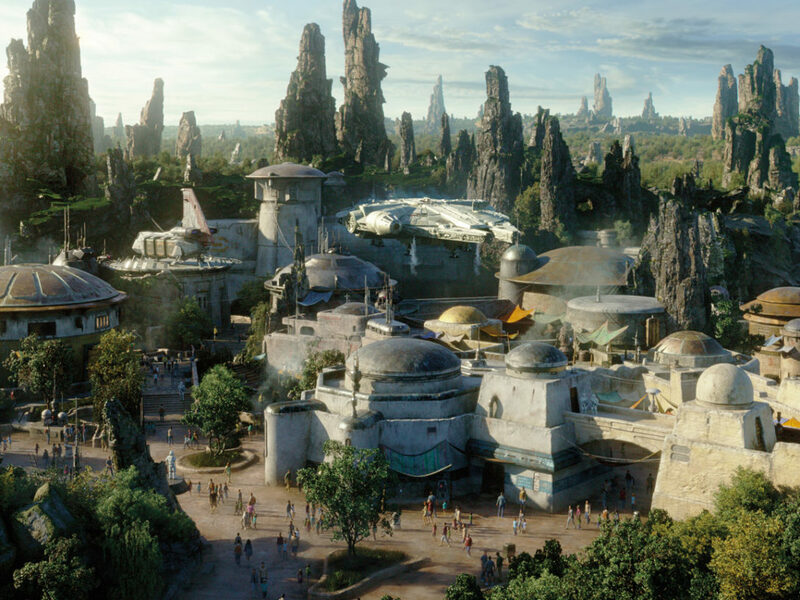 When Boba arrived, it was genuinely exciting — granted, I was 29 at the time, so my reaction was tempered a bit. And as it turned out, the extra-Anakin karmic boomerang came back around: a friend of mine had a spare Boba Fett, which he gave me. (I don’t think he cried, worrying that he would upset whoever delivered it. But maybe he did. And I would understand.) It’s an excellent figure filled with history, and I’m really happy to have it. The 2010 mail-away Boba Fett, in package. Mail-away figures, ultimately, are smart marketing: They can make you buy more toys than you really want or need in order to get that one must-have. But they’re also just fun, plain and simple, adding a bit of surprise and wonder to being a kid — and to being an adult collector. In a time where most anything can be bought with the click of a mouse and arrive overnight, there’s something a little more rewarding and romantic about them. They ask you to be more proactive and to be patient, which is why, I think, most mail-away figures tend to hold a special place in people’s collections and hearts. Mail-aways are still part of Star Wars collecting, and hopefully, always will be. 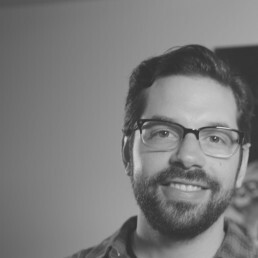 Dan Brooks is Lucasfilm’s senior content writer, and spends his days writing stuff for and around StarWars.com. He loves Star Wars, ELO, and the New York Rangers, Jets, and Yankees. Follow him on Twitter @dan_brooks where he rants about all these things. 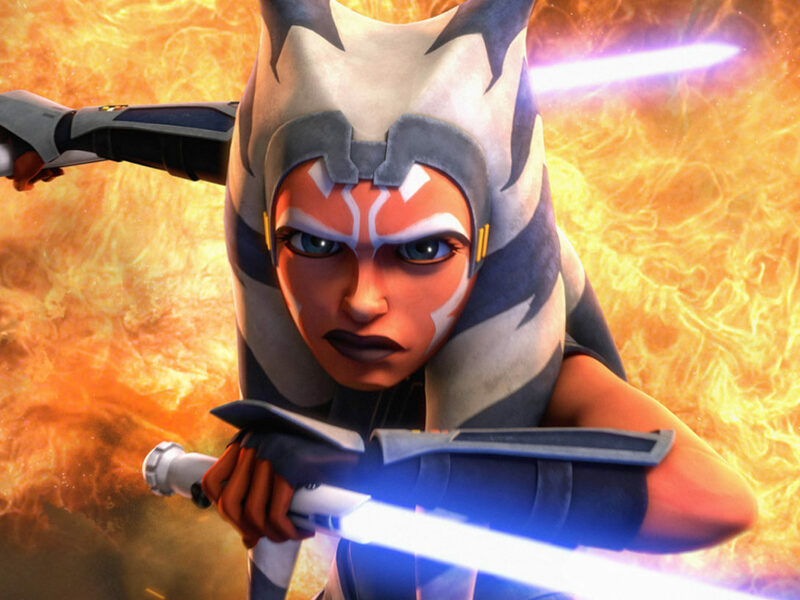 Special thanks to The Star Wars Collectors Archive for the use of several images in this post.